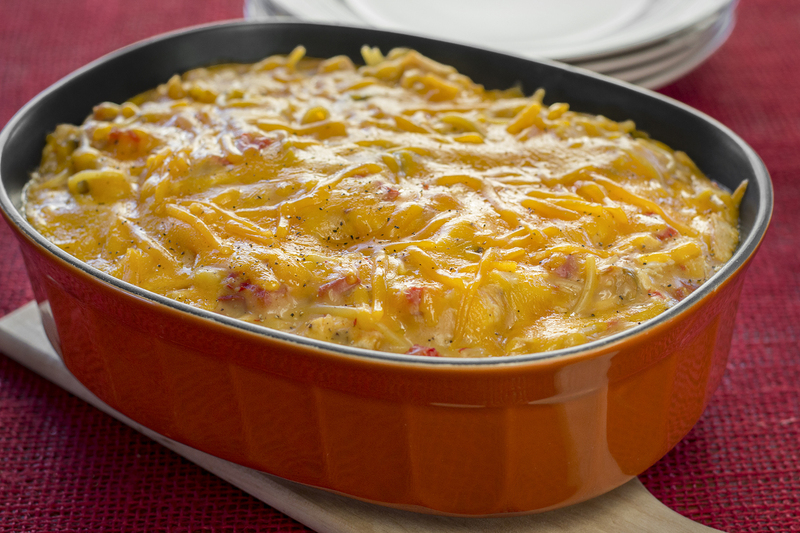 This spicy, rich, and creamy casserole with golden brown melted cheese is loaded with Southwestern flavor! Prepare grill. Position grill rack 6 inches above the coals or heat source. Grill chicken for 3 to 4 minutes per side or until thoroughly cooked. Transfer chicken to plate. When cool enough to handle, cut into 1/2-inch squares. Combine soups, tomatoes, and green chilies in a large bowl. Stir in cooked chicken and pepper. When spaghetti is done, drain well. Add to chicken mixture and stir until well blended. Pour into prepared pan. Sprinkle with cheese. Bake for 30 to 40 minutes or until sauce is bubbly and cheese is golden brown. If you’d like a less spicy version, the mild version of diced tomatoes and green chilies may be substituted for original and cheddar cheese soup may be substituted for the nacho cheese soup.